Place your plants directly into EKO Organic Outdoor Planting Mix, and water in. Plant at a depth according to instructions provided by your local nursery, or information on identification tag. When planting or transplanting trees and shrubs after the dirt has been removed from the desired planting location, place EKO Organic Outdoor Planting Mix in the bottom of the hole to a 2″ depth. Place your tree or shrub in the prepared area. Mix EKO Outdoor Planting Mix with 2 parts native soil and fill in around the root ball of the plant. The popularity of growing plants in containers is rapidly increasing, and EKO Outdoor Planting Mix is the ideal mix for all types of outdoor container plants. There is no need to add anything, just carefully place your plants, add water as needed, and enjoy the results of using a quality Colorado-made product. 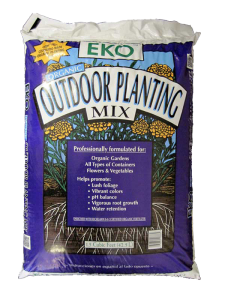 EKO Outdoor Planting Mix is 100% organic, and is comprised of EKO Compost, sphagnum peat, pumice and dehydrated poultry waste. This planting mix contains everything your plants need for optimum health and vigor. After your plants have established, use Gro-Rich Rose and Perennial Food at 4-5 week intervals throughout the growing season to maintain strong and healthy plants.